Why Dental Cleanings are so Important and How you can benefit. 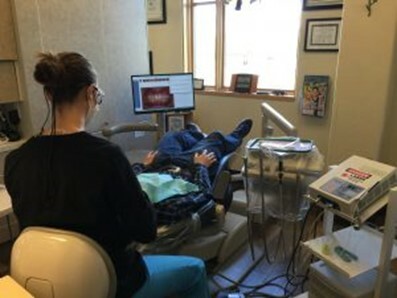 Hygienist Jamie Rotunno pictured above performing a routine dental cleaning and laser therapy. Most of us know what a cavity is, or at least have been told by our mothers that we should not eat candy as it will cause us to get cavities. She probably mentioned as well that those little cavities will eventually cause you to lose your teeth if left untreated. Well, guess what? Mom was right! Cavities are caused by a whitish colored film called biofilm (also known as plaque) that builds up on the surface of our teeth. This film is the leading cause in tooth decay. Sometimes it can be so stubborn that even brushing and flossing twice daily will not remove all of the difficult biofilm which likes to live in the nooks and crannies of our teeth. Luckily when you come in for your regular dental cleaning your Dental Hygienist will have all the right tools to remove even the most tenacious of biofilm!! Gum disease which starts as a buildup of biofilm (plaque) on the teeth, when left untreated is the underlying cause for tooth loss. As the biofilm builds around the tooth it starts to make its way down into the surrounding gum tissue where it starts to destroy the supporting bone causing your teeth to loosen or even fall out. A study published by The Centers for Disease Control and Prevention (CDC) in 2012 estimated that 47.2 Percent of American Adults age 30 and over have some form of Periodontal or Gum disease. In all cases more frequent dental cleanings are needed to prevent tooth loss. 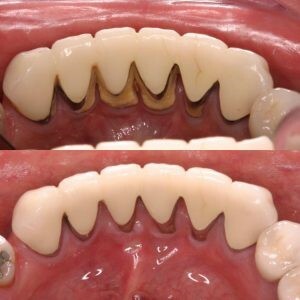 Before and after photos of “tartar” build-up on the back of some of the lower teeth on a dental client from McCreight Progressive Dentistry. The tartar was removed with the use of in-office diode laser therapy, microsonics and the client using PerioProtect trays at home. If you are like myself you start each morning with a great big cup of JOE sometimes even following with a mid morning cup to keep yourself going. Which by all means is fine, but surely like myself you do not immediately follow drinking your coffee with brushing your teeth. Coffee like many other colored drink options leave your teeth slightly stained after drinking. These stains often times dull or discolor our smiles. During your regular dental cleaning the hygienist is able to remove those stains to restore your beautiful bright smile! Is there anything worse than going in for an introduction and being blindsided by the smell of someone’s bad breath? We have all experienced that at one time or another, most of us not realizing that we also may have bad breath! Of course the best way to combat bad breath is with a great oral hygiene routine of regular brushing with your Sonicare and WaterPiking. Unfortunately, like stated above biofilm is not always possible to remove on your own which is why it is imperative that you come in at least twice a year to get it removed by your hygienist during your routine dental cleaning. Many areas within your body have good and bad bacteria which is also true about the inside of your mouth, while most of these bacteria are harmless some do cause us to raise concern. In fact, in a recent study by the Academy of General Dentistry, more that 90 percent of all systemic diseases produce oral signs and symptoms. A report from the Mayo Clinic highlights some of these complications. Dementia- The bacteria may enter the brain through either nerve channels in the head or through the bloodstream. Respiratory Infections- The Journal of Periodontology warns that gum disease could cause you to get infections in your lungs, including pneumonia. While this may be far fetched for some, for the next minute concentrate on your breathing. Did you notice anything? For me, I noticed nothing abnormal, just me breathing as normal which is exactly my point! If you have “bad” bacteria in your mouth you are constantly breathing that into your lungs. Diabetic complications- For those of us living with diabetes inflammation of the gums can make it harder to control your blood sugar which can cause your symptoms to worsen making proper dental care even more important. If you are looking to grow your family in the future or are expecting a child it is never a bad idea to check in with your dentist to make sure that biofilm and “bad” bacteria levels are under control. It has been proven in recent years that bad bacteria from gingivitis in your mouth can raise your chances of having a low birth weight baby or can even result in a still-birth.